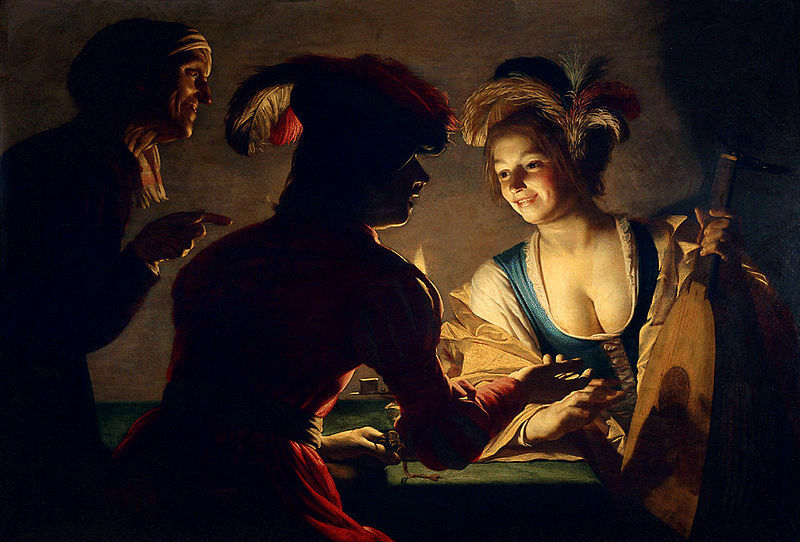 The Matchmaker by Gerrit van Honthorst, I just like this one so I thought it should be first. Anyway, interesting innovation of figure highlighting with chiaroscuro -type techniques. 3. a. A woodcut technique in which several blocks are used to print different shades of a color. b. A woodcut print made by this technique. 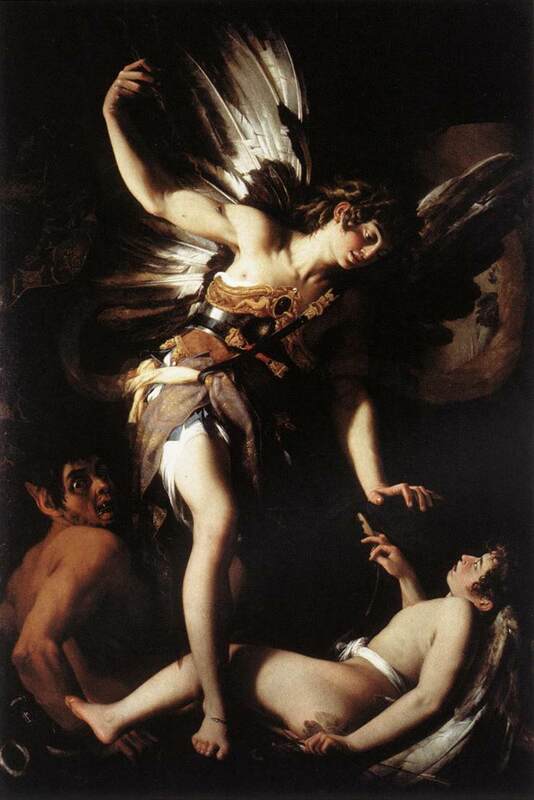 Today in art, chiaroscuro refers to the use of strong contrasts between light and dark. The bold contrasts affect a whole composition by adding drama, navigating the viewer’s eye’s, highlighting important figures, etc. Chiaroscuro also is a technical term used by artists and art historians for using contrasts of light to achieve a sense of volume in modeling three-dimensional objects, such as the human body. Photography and cinema also have adopted the term, so similar effects in the lighting in film or in a photo can also be described as chiaroscuro. The more technical use of the term chiaroscuro is the effect of light modeling in painting, drawing, printmaking, and photography and film, where three-dimensional volume is suggested by the value gradation of colour and the analytical division of light and shadow shapes—or just shading. Chiaroscuro can be achieved through a variety of techniques. In drawings and prints, artist can use hatching (shading by parallel lines) washes, stipple (dotting effects), and surface tone (texture) for the desired modeling chiaroscuro. In photographs, the photographer can adjust lighting to creat shadows, or on a computer he/she can tweak contrast and other levels in a photo editor. But the history of the effect vs the word was much more complex than I could have imagined. Actual use of the term dates back to the Renaissance when “chiaroscuro” described either colored woodcuts printed with different colored blocks or a specificform of drawing on colored paper with a dark medium and white highlighting. The “chiaroscuro woodcuts” feature different color rather than strong contrasts of light and dark. In some German two-block prints, the keyblock (or “line block”) was printed in black and the tone block or blocks had flat areas of color. They were first invented by Lucas Cranach in Germany in 1507, and first made in Italy by Ugo da Carpi sometime around 1516. Other printmakers using this technique include Cranach, Hans Wechtlin, Hans Baldung Grien, and Parmigianino and in Germany this technique achieved its greatest popularity around 1520. It became popular in Italy during the later half of the sixteenth century. 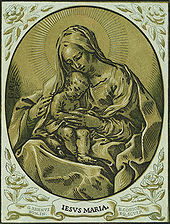 In Italy, chiaroscuro woodcuts were produced without key blocks and produced a very different effect. They resembled the style of wash drawings and also came to be known as chiaroscuro. So when discussing Italian art chiaroscuro can be used to describe any painted image in monochrome or two colors (In English and French the equivalent is grisaille). Early on the term was broad, covering all descriptions of strong contrasts in illumination between light and dark areas in art, which is now the primary meaning. Though the word chiaroscuro was not used until the 1500’s, the invention of the effects of contrast was well before. The famous Athenian painter of the 5th century BC, Apollodoros, made skiagraphia, or “shadow-paintings” to the Ancient Greeks. Although virtually no Ancient Greek painting survives, their understanding of the effect of light modeling can be observed the mosaics of Pella, Macedonia, in particular the Stag Hunt Mosaic, in the House of the Abduction of Helen, from around the late 4th century BC. The technique also survived in a standardized form in Byzantine art but was rather curve. During the the Middle Ages contrasting effects were further refined in painting and manuscript illumination in Italy and Flanders, and then spread to all Western art. The Raphael painting illustrates the effects of lighting demonstrating how delicate modeling chiaroscuro gives volume a figure, and how strong chiaroscuro uses contrast to distinguish hierarchy between subjects; in the painting the main subject is the the well-lit model and the very dark background of foliage recedes to the background. But chiaroscuro was still not used to describe this kind of modeling at the time. Strong chiaroscuro became a popular effect during the Mannerism and Baroque periods in the 16th century. The effect used light to suggest divinity and usually consisted of dark subjects dramatically lit by a shaft of light from a single constricted and often unseen source. Early developers of this compositional device were Ugo da Carpi (c. 1455-c. 1523), Giovanni Baglione (1566–1643), and Caravaggio (1573–1610), the last of whom was crucial in developing the style of tenebrism, where dramatic chiaroscuro becomes a dominant stylistic device. Tenebrism was especially practiced in Spain by Jusepe de Ribera and his followers. Illumination was also employed in compositions by Tintoretto, Veronese, and their many followers. Adam Elsheimer (1578–1610), a German artist living in Rome, produced several night scenes lit mainly by fire, and sometimes moonlight. Unlike Caravaggio, his dark areas contain very subtle detail and interest. Baroque artist Artemisia Gentileschi (1593-1656) was also a follower of Caravaggio and demonstrated outstanding works of tenebrism and chiaroscuro. Another follower of Caravaggio was Peter Paul Rubens, who exploited Carvaggio’s respective approaches to chiaroscuro for dramatic effect in his paintings. A particular genre that developed from explorations of chiaroscuro was the nocturnal scene lit by candlelight, which looked back to earlier northern artists and more immediately, to the innovations of Caravaggio and Elsheimer. This theme played out in the early seventeenth century by artists in the Low Countries, such as Gerrit van Honthorst and Dirck van Baburen, and with FLemish Baroque painters, such as Jacob Jordaens (later referred to as the Utrecht Caravaggisti). Rembrandt‘s early works from the 1620’s also adopted the single-candle light source. 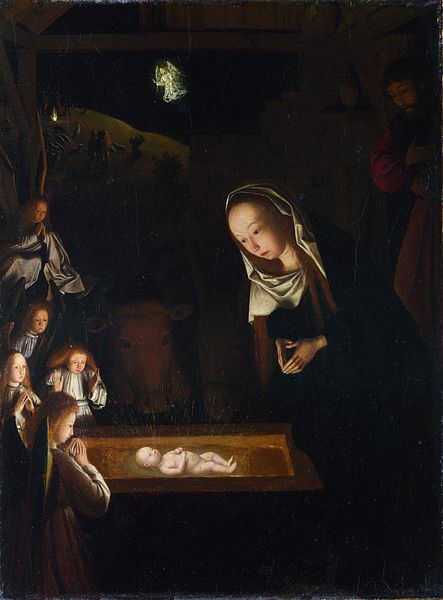 The nocturnal candle-lit scene re-emerged in the Dutch Republic during the mid-17th century on a smaller scale in the works by Gerrit Dou and Gottfried Schalken among others. Outside the Low Countries, artists such as Georges de La Tour and Trophime Bigot in France and Joseph Wright of Derby in England, carried on with such strong, butgraduated, candlelight chiaroscuro. Watteau used a gentle chiaroscuro in the leafy backgrounds of his fêtes galantes, and this was continued in paintings by many French artists. At the end of the century, artist used a heavier chiaroscuro for romantic effect. And finally, the French use of the term, clair-obscur, was introduced by 17th century art-critic Roger de Pilas in the course of a famous argument (Débat sur le coloris), on the relative merits of drawing and colour in painting. The term is less frequently used after the late nineteenth century, although the Expressionist and other modern movements make great use of the effect.